If anybody ever asks you the world’s greatest jazz guitarist is, you can answer with confidence that no such person has ever existed. But in 1962 or thereabouts, somebody was trying to tap Elek Bacsik for this conceptual dead-end of an honor. Who? That was my thought when I first saw this record. Apparently he was one of Django Reinhart’s cousins. And so I brought this home with me. I don’t love it. If you like guitarists who play a lot of notes really fast and will dash up amd down the neck in modal sprints at the drop of a drum stick, then Elek Bacsik is likely to bring you a lot of pleasure. That’s not my favorite approach, though I certainly enjoy it in the right quantity. But I would have preferred some more melodic ideas, a more sensitive touch. Bacsik has some shapes and intervals he likes enough that you hear them repeated in different tunes, which suggests to me the “blowing over changes” style of jazz improvisation. The actual tune, melody, song and its meanings and feelings are left standing on the sidewalk as the musician speeds away in a muscle car. And I think it would be fair to say that interaction, another crucial element of improvised music, is not particularly important to Mr. Bacsik, at least on this record. The liner notes will explain it more concisely than I can: “All of the tracks in this album were done first by recording the rhythm guitar part along with the rest of the rhythm section and then, at a later date, the melody line”. Well, there you go. When he’s improvising, he’s playing over a tape recording of a band. Interaction has been made impossible. The liner notes attempt to bluff their way through this: “This enables the guitarist to weave his own rhythmic patterns for his solo”. Yeah, nice try, but no. Having two Elek Bacsiks on every tune, playing two different parts on the same guitar on two tracks, also creates an uncomfortable, claustrophobic feeling. The impression he gives is of someone with a big personality, a loud voice and a lot to say. Two of him is one too many. And who’s playing with him? On some tracks you’re hearing Pierre Michelot on bass (“the first Frenchman to treat the bass as a melodic instrument”, the liner notes inform us) and Kenny Clarke on drums. On other tracks the rhythm section is Michel Gaudry on bass and Daniel Humair on drums. But if you want to know which tracks feature which rhythm section, you won’t find it noted anywhere here, with the exception of “Take Five”, about which we’re told “Take Five really takes the cake, as you will hear in the strange drum solo that Kenny Clarke takes”. What’s strange about it? Well, as I recall, he mainly just plays hits on the snare and leaves a lot of space. I found myself wondering if maybe Mr. Clarke was just a wee bit bored. This is overall a decent record, however, pretty fun to listen to, despite my reservations. 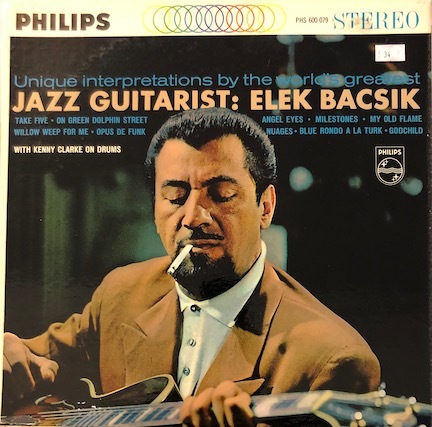 Elek Bacsik plays the guitar very well, but he doesn’t make my list of ten greatest jazz guitarists or probably even twenty.